HEA Annual Conference 2012 – Archive of Tweets & Top Tweeters! I attended the HEA Annual Conference from 3rd – 4th July 2012, presenting a poster on MP3 audio feedback to students. I enjoyed a number of sessions and also participated via Twitter using the conference hashtag #HEAConf12. Using Martin Hawksey’s excellent twitter archive tool I include here a link to all of the tweets posted using the conference hashtag. Click the image above to go there, or this link! The tool also provides some nice summary data such as the top tweeters. List below. Hope you find this useful. I seem to have been talking about SMS texting a bit over the last while. Last week I was invited by Kevan Gartland to Glasgow Caledonian University to participate in an event on Feedback Enhancement in the Biological Sciences. This was one in a series of seminars on this subject organised by Glasgow Caledonian University in association with the Higher Education Academy. I outlined our use of text messaging (as described previously) especially in assisting with peer marking and rapid communication of results following a written class test for around 100+ students. Also presenting at the event was Jamie McDermott from GCU who was demonstrating his use of www.textwall.co.uk especially in an inter-professional context in a session with some 500 students. This has proved most successful in engaging students in this large lecture context with many asking questions by text message were they would normally have been reluctant to pose a question verbally during the session. Then this week I was off to Antwerp in Belgium for the 2012 BlackBoard Teaching and Learning Conference. This time I was invited by Travis Sowders of BlackBoard Connect to be involved in a panel discussion on the use of SMS text messaging in the classroom. Travis chaired the session and there were contributions by Jo Spiller from University of Edinburgh and myself on our three uses of texting at Ulster; communication, feedback and voting. For me one of the highlights of the conference was the keynote address by Kayvon Beykpour, general manager of Blackboard Mobile. He described the work that had been done to introduce push notifications in BlackBoard meaning that students can receive up-to-date information straight to their handheld device. This was well received by conference delegates. However, it was the second part of his presentation that appealed to me most where he described the new developments in mobile-enabled class tests / examinations. Tests set up in the mobile environment can be made available to users of an array of mobile devices, but they can still be accessed in the traditional way via a computer connected to the VLE. This new feature opens the possibility of running multiple choice and short answer tests for large groups of students, each accessing the test from the familiar platform of their preferred mobile device. I was also most impressed with a demo of Kaltura video sharing software for Blackboard. This facilitates a You Tube type environment where video may be shared in a number of different ways to different user groups. For me this represents an opportunity to consider upgrading the platform for our YouTestTube video sharing project adding mobile functionality and making the site much more accessible. Not surprisingly, WiFi access throughout the conference venues was excellent and worked flawlessly. 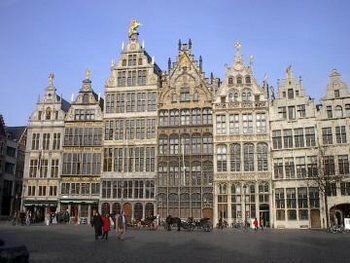 Antwerp is also a charming city to visit. The Best Way to Get Going With Twitter. Just Jump In! I have been using Twitter for a while now mainly for work purposes; teaching and researching within a bioscience environment. Twitter has been a useful of means of networking with like-minded colleagues in other institutions primarily on mattters of teaching and learning in higher education and extends conversations beyond those facilitated by face to face networking opportunities at conferences or other events. I don’t follow a huge number of people neither do I have a huge following and I certainly don’t claim to be a “Twitter expert”. Sometimes I get questions on what Twitter is all about and the occasional admission from colleagues that they “just don’t get it”. With this in mind I supply the list below of my thoughts and tips after just over one year of tweeting. The best way to start is to jump right in. Register an account and get going. Follow an established tweeter (or lurk for a while if you are feeling shy) to see how the thing works. Make sure your profile is informative. If your username is very cryptic (like mine – PlanetChemistry) AND your picture is not of you or has not been updated at all users will not know who they are communicating with. Make sure you provide some information about yourself in the bio – concisely done in less than 160 characters. Contribute! Reply to other users’ comments and get involved; that’s the best way to build a network. Take a look at the people being followed by the people you follow as possible members of your network. Depending on your area of expertise or interest, most professional bodies, journals and funding bodies now have a presence of Twitter. In my own subject area this includes the UK Centre for Bioscience, the UK Centre for Physical Sciences and the Higher Education Academy. Following these organisations allows for early notice of calls for funding or calls for conference papers. Don’t rely on automatic tools to update your page. Feeds from your blog are fine so long as your Twitter page is not composed solely of them! Remember that Twitter is better for conversation: not broadcast! Use a tool like TweetDeck to help organise your followers and groups and so that you can keep a track of conferences and events through the use of #hashtags. Hashtags are short tags added to each tweet relevant to a conference or topic under discussion and allows relevant tweets to be aggregated together. For example, #edtech10 was the hashtag for the recent Irish Learning Technology Association conference and allowed the conversation around this event to be followed by delegates at the event and others participating remotely via Twitter. Following conferences via Twitter has been most useful for me and you can read my experiences of following the Learning and Teaching in the Sciences 2009 unconference at the University of Leicester, the Plymouth e-Learning Conference (PELC10) and the ESTICT (Engaging Students Through In Class Technology) event in Edinburgh on 29th April 2010 on this blog. Enjoy it! Tweeting is about “networks not destinations” (@AJCann) so it’s an opportunity for you to collaborate online and extend your network on a regular basis. You will soon discover that there are numerous things Twitter can be used for. No doubt I will add to the list above as the weeks go by.. but does anyone have anything else to say? I didn’t go to the Plymouth e-Learning Conference (PELC10) this year. As I only found out about PELC earlier this year, Twitter was a great way for me to get a feel for the conference without being there in the flesh. This provided a great way of getting a flavour of what was going on, who was there and the issues that were discussed around the various presentations. Twitter was used extensively by many of the delegates via the #pelc10 hashtag and the conversation that ensued added a further dimension to the conference for those only able to participate in silico. All in all I was most impressed by the organisation of the conference and the topics covered. The microblogging back channel certainly extended the impact of this event. For me this was further evidence of the power of Twitter; an excellent means of social networking and participating albeit remotely in conferences and other events. Who says that Twitter is dead? I tried this academic year to persuade my year one students to engage with Twitter. It wasn’t terribly successful, and many of them said they preferred Facebook. That said; maybe next year I’ll think more carefully about what we ask students do with Twitter; or perhaps Friendfeed. The web 2.0 /science nexus has a power for good that needs to be further explored. JISC TechDis have now collated lots of resources from the HEAT3 project on their website. These include videos of presentations given by some of the project holders at the Higher Education Academy Conference as well as project reports, and copies of posters etc. Imaginatively entitled “HEAT on Tour” it demonstrates the breadth of practice that has been facilitated though this very worthwhile scheme. You can view all of these resources by clicking the link above. The YouTestTube.com presentation is given below. Today I took part in the Learning and Teaching in the Sciences 2009 unconference at the University of Leicester. There were a number of participants from different parts of the UK and we had opportunity to discuss various aspects of teaching, learning and assessment. I had opportunity to learn from colleagues on their strategies for providing feedback to large groups; particularly laboratory classes. It was also interesting to see that a number of colleagues had developed pre-practical assessment as we have done with Introductory Chemistry labs at Ulster. Overall it was a very worthwhile event…. I suppose I should mention that the meeting started about 10:30AM and ended about 12:30PM with lunch. For most of us from N.Ireland this type of meeting involves an early morning start, drive to the airport, flight delay, taxi on the other side, attend the meeting and then do it all in reverse, arriving home on a Friday evening frazzled. Today was a much more pleasant experience as I was able to follow and participate in the event via Twitter. In fact I didn’t even have to leave my desk. The conference could be followed via a Twitter hashtag (#uollts) or using the amazing TwitterFall which I only discovered after the event! Responses from non-attending delegates were relayed onto a screen in the conference room. So we all got our say! This was networking in the best sense of the word. A big “thanks” to all who took part and most importantly to the organisers who made it such a great success.